Joseph Saputo submitted this photo and caption. This photo is of students from the University of Kentucky during the 2009 World Championships at Lucas Oil Stadium in Indianapolis. We all aged out of DCI this summer and this picture is from the age-out ceremony following the Semifinals. 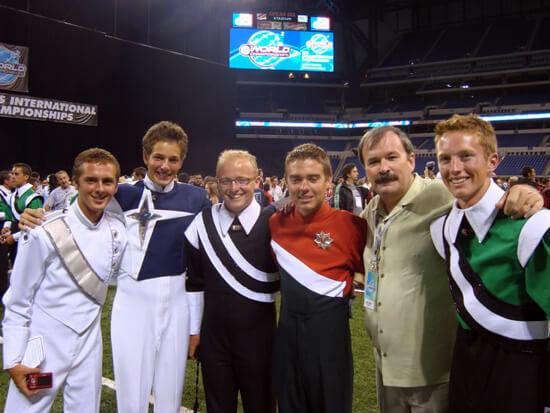 From left to right: Mike Hardin, Phantom Regiment front ensemble; Joseph Saputo, Blue Stars mellophone; Alex Harmon, Cavaliers drum major; Andrew Jarvis, Santa Clara Vanguard front ensemble; Jim Campbell, UK percussion professor and DCI Hall of Fame member; David Hutter, Cavaliers front ensemble.